The first message failed to give the date. Apologies. Just to keep you informed, we are taking part in a Community Litter Pick in the Langley Mill area. 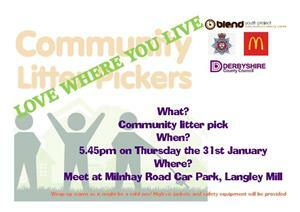 The litter pick is in conjunction with Derbyshire County Council, Blend Youth Centre and McDonald's. If you know if any young people who would like to take part refreshments will be provided at the end of the litter pick. Meeting at the Milnhay Road car park, Langley Mill at 17:45 hours Thursday 31st January 2019.